CLEVELAND, Ohio, October 15, 2013 (ENS) – Cycling along on his rocket trike, an anti-tar sands pipeline activist Monday left Cleveland heading for the White House to deliver a petition calling on President Barack Obama to stop construction of an oil pipeline from Cushing, Oklahoma to the Texas Gulf Coast. TransCanada says the US$2.3 billion pipeline will be ready for commercial operation before the end of this year. 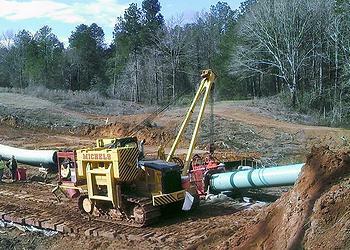 Initially, the pipeline is expected to carry 700,000 barrels a day of crude oil. Eventually, it could transport 830,000 barrels a day of oil extracted from the Canadian tar sands in northern Alberta to refineries at Nederland, Texas. TransCanada is the company that has twice applied for a Presidential Permit to construct and operate the Keystone XL pipeline from Hardisty, Alberta to Cushing. Because it crosses the Canada-U.S. border the President must determine that the pipeline is in the national interest. Slowed by investigations into conflict of interest on the part of two contractors who wrote Environmental Impact Statements for the U.S. state Department, that determination is not expected until next year. If the Keystone XL pipeline is approved, tar sands oil would move through pipelines all the way from Alberta to the Gulf Coast. Weis, and the more than 7,000 people from all 50 states and many nations who signed the petition he carries, worry that extracting, processing and burning the heavy bitumen extracted from the Alberta tar sands will accelerate climate change. 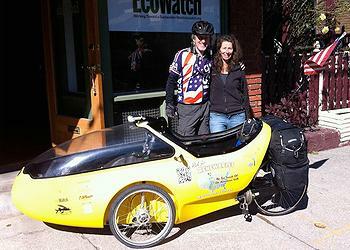 Weis set out on his velomobile, a recumbent tricycle wrapped in a lightweight aerodynamic shell, from the Cleveland office of EcoWatch, an environmental advocacy group that support his message. Spear and others warn that the pipeline would accelerate the growth of one of the most polluting fuels on the planet. The tar sands are vast deposits of bitumen, a tar-like substance turned into oil through energy- and water-intensive processes that damage the environment. So heavy that it cannot flow through a pipeline, the bitumen is diluted with lighter hydrocarbons for pipeline transport. Global concentrations of greenhouse gases such as carbon dioxide, CO2, in the atmosphere now have reached 394 parts per million, up from 280 ppm before the Industrial Revolution and the highest levels seen in at least 800,000 years. Critics of tar sands oil development estimate that producing and processing the heavy tar sands oil emits roughly 14 percent more greenhouse gases than the average oil used in the United States, raising the planetary temperature at a rapid rate. Lester Brown, president of the Earth Policy Institute in Washington, DC, also signed Weis’ petition.